When I was a kid I hated writing. I don’t use that word lightly, but I really did. It wasn’t just writing, it was reading too. I didn’t read a full book until grade 9. I’ll share with you another time what changed in my life that almost instantly gave me a huge appreciation for books and writing. But once that happened everything changed. I started writing poetry, reading books all the time, and in my third year in college wrote my first book, Profitable Relations (which was later published through Amazon). Since that time I’ve written five publications and books on consulting and marketing with another in the works. I’ve written for forty or so media outlets, trade sites, blogs and authority portals. Would you also like to get published in industry or trade publications? If the answer is yes you’ll find the following article based on a presentation I gave to my Accelerator Coaching Program clients to be valuable. Having your content published is really a great way to establish your authority and get in front of your ideal clients, but sometimes it can feel a little bit overwhelming. It can feel a little bit challenging in terms of actually how to go about it and how to be successful with it. I want to break it down and to share with you some best practices that are out there as well as give you an example of something that I have done in the past to land opportunities to get published in well-respected publications that have a large reach. 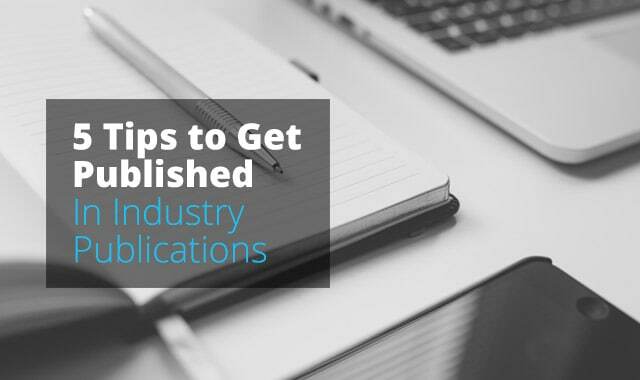 The first thing to keep in mind when we’re talking about how to get published in industry or trade publications is that this is an authority building strategy and it can take time. There are many different strategies and tactics that we all have available to us as consultants and this is one that I classify as being in the authority building category. This can be applied to writing for trade publications, websites or blogs, so it doesn’t matter if it’s a print or a digital publication. Really, the whole idea here is to get your content and knowledge in front of your ideal clients in a way that positions you as an authority. When you are published, whether in an online or offline publication that you or your clients read, it reinforces that you are an authority or expert in their mind. The one thing here is that this can take some time to do so. It’s not necessarily that you just decide to do it today and you get published tomorrow. Having some samples is key. It’s OK if it’s on your own blog, but it’s even better if you’ve already been published somewhere else. I just want to add the caveat that this isn’t a quick play; this isn’t an instant result generator, but it is something that can be very, very beneficial to all of you as long as you can identify that your ideal clients are reading publications, or visiting certain websites, or engaging in blogs. With that understanding, know that it can be very powerful. Everyone should think about having this in their marketing mix and this is the way to begin if you’re just getting started. If you haven’t been published in any publications previously, go for the low-hanging fruit such as local or smaller publications, smaller blogs or smaller trade websites. The idea is that before you approach larger publications, start off with smaller ones first so you can build and that enables you to show your writing examples to larger publications. If you want to get published in the Harvard Business Review, or MarketingProfs, or Inc magazine, or Fast Company, or whatever it might be, they will typically want to see samples of your writing first. They want to know not only that you’re good at what you do, but also that you can write well. There are many local or smaller publications, again online and off, that are starving for content. They typically generate revenue from publishing content or they have a membership base they need to provide content to. Most will be excited to hear from you if you reach out to them and make that offer to write for them. It’s a much easier play to get started with the smaller ones than to approach a larger publication right off the bat. I would like to share five steps and best practices to help you with this. If you study how to get published, these are considered the golden standard. I’ve been published in close to 40 different publications, anything from the Fox News to Marketing magazine to MarketingProfs, Huffington Post, Consulting News, and more. I want you to have the full view to really understand what is considered the ‘right approach’ and then how you can hack that to potentially see results even faster. Here we go. The first concept is don’t pitch. A lot of people talk about how you need to pitch your article. How do you pitch to a reporter or an editor? Well, the idea here is not to pitch. So don’t pitch. Think about how you can start building a relationship with someone who can help get your content in front of your ideal clients. If you go in with a mindset of pitching then you are really trying to get something that benefits just you. That’s not a good way to start building a relationship, and ultimately everything we do in business is about relationships with longevity in mind. You don’t want to just go in and say, “Hey, I want to write for you guys. Here it is,” especially if you’re approaching a larger publication. That’s not the most effective way. Most of these publications are inundated with requests, almost all of them from people that don’t have the same level of experience as you. And there are a lot of spammers. At the end of the day, reporters and editors constantly receive requests for content because everyone wants the benefits of being published both for search engine optimization and for reputation building. While building these relationships is a one-to-one approach and can be time consuming, the pay off is worth it. Once your content is published it will be seen by hundreds if not hundreds of thousands of people. Again it can be time consuming but once your message is out there and seen by many people your lead generation can really take off as people contact you to learn how you can help them.. The second observation is to provide value first. What I mean is that once you’ve identified your target ideal publications, you need to find out who the key person at that publication is and work on creating a relationship with them. If it’s someone that has written content, for example a blog owner, then you can approach them and reach out by making a comment on an article they’ve recently published, tell them how much you liked it, and then start to give some suggestions. You need to figure out how you can provide value to this person, not just how you can sell this idea of getting published to benefit yourself, but rather what can you do to demonstrate value for them. The third step is to make a list of 10 to 20 top publications and their writers or editors. In almost all industries, whether it’s an established publication or a trade industry website or a blog or even a specific business newspaper, you can find this information. You can easily find 10 or 20 publications that you want to contribute to, especially when you add in the websites too. If you don’t have that list then you’re just going to be flying off-the-cuff and it’s not going to help you to really dig deeper into the process. Make that list. The fourth step is to reach out. That means to contact the writer or the editor and praise them, tell them how much you’ve enjoyed their content, how much you enjoyed their last article. You can also provide a comment on an article that is related to your area of expertise. So go in, connect with them, give them some praise and find ways to add valuable context to the topic they’ve written on or what their site is all about. The fact that you’re making a knowledgeable comment instantly positions you as a person who knows what they’re talking about and they will think this is someone they should know. You’re making a proactive comment about their article; it’s relevant and it’s establishing you as an authority right away. So now you’ve established a relationship on the right foot, and have reached out. After your first email or contact with the point person at the publication you’ll want to send a second email. The first email was all about establishing a relationship. The second email is about how you can add value. You can do this in your first email. But the best practice is not about rushing it; it’s about building the relationship, and if you go in too quickly, too directly, sometimes that’s not the best way to establish the relationship. Just think a little bit about that. You can definitely test it out and see what you’re more comfortable with, but I would recommend you try both. That’s the 5 steps. It’s building that relationship, having that target list, reaching out to them, commenting, engaging, and demonstrating you are an authority, giving them some additional points and then offer to write an article for them. It’s really as simple as that if you follow it, but what’s really important is that you do follow the process. Now with the best practices I shared with you above out of the way, let me say that I have found something to be even more effective, which is more direct. Perhaps because I don’t have the greatest amount of patience, and I like to do things that get results quickly. It doesn’t mean that I don’t value building relationships; I certainly do. I place a lot of value relationships, but I’m always looking to find a more direct way to get a result. Instead of all the steps above I’ve been able to achieve the same results with just two steps. First step – Make a list of target publications and the key person there. Second step – Contact them, praise their work and publication, mention your expertise and offer an idea for an article for them. I believe in order to make this shorter and more direct approach work you should have written for other publications already or have some very solid and engaging material on your own site or blog. You must be able to demonstrate some very clear value and expertise. Like in sales, when you’re going through this process, not every single publication is going to say yes to you right away. If you take silence or an initial ‘I’m not interested’ as a failure you’re not going to get very far. Instead you want to keep following up, suggesting new article ideas until they are accepted. Remember that and just expect that there needs to be a follow-up, like anything typically worthwhile in life; it doesn’t come right away and doesn’t come easy. Let me just mention one other thing, which is to leverage your contacts. Oftentimes, you can find people you know that have either written for a publication previously or that might be able to make an introduction for you. Once you have your list of publications and editors or writers, you can go on to LinkedIn and type in that person’s name and it’ll come up and show you are a first or a second. Obviously, if you’re a first connection it’s easy, “Hey, we’re connected on LinkedIn,” but if you’re a second connection that means someone you are connected to is connected to them. You need to leverage your contacts because anything that can help to strengthen that relationship, anything that can help to establish trust and credibility more quickly is really beneficial in this process. The number one reason why publications say no to people is because they don’t yet believe that you are an authority in your area and they don’t yet trust that you can actually do what you say that you’re going to do. This is because they’re inundated with people just making hyped up claims or people spamming them to try and get the benefits of being published especially when it’s online. Here’s an example I’m going to share with you from a while back, but I think it’s really powerful and that’s why I want you to see it. I wanted to get published in MarketingProfs, a very well-known online marketing publication with global reach, and I wanted to further position myself as an authority. This is going back now probably about 3 years but it’s a great example and I want to share it with you. Let’s just dissect what’s going on here. 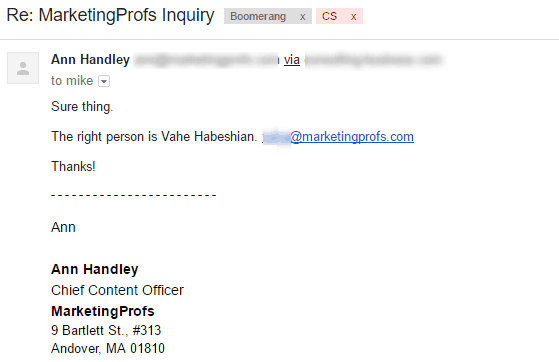 Actually, I didn’t do the best thing here because I wrote it just to MarketingProfs as a general email. This was all I found at that time. It would be even better if I was writing to someone specifically. But I did put in the name of a colleague or a friend who had already written for them so that instantly helps to boost my credibility. I’ve already told them I’m thinking about writing an article on a specific topic that I believe that they will find of interest. Then I tell them what they’re going to get from it, what the article is about, and that really this gets them a bit more interested. I’m saying that it would probably a great fit for their readers and that I’m happy to send it over if they want to take a look. What’s really important is that I’m really establishing authority and credibility; I’m saying this is my LinkedIn profile and here’s a sample of what I can do for you. When they go to my LinkedIn profile, they can instantly see that I know what I’m talking about, that I’m the real deal, I’m not just someone trying to get links for my website or whatever. Although certainly that was a benefit. I’m giving samples they can actually click on it and see, and most likely I chose examples where there’s some engagement or ones I just thought were really good. Another option I could have tried would be to say, “Here’s an example of an article I had recently published in Huffington Post,” or whatever it would be. That would also be really beneficial. The reason why I’m going direct here, again, is because I don’t have the patience of going through the whole process, I want to just get the result. I want to get them say yes or no and then move on to the next and keep following up and so forth. I have an idea, but I didn’t have to write this article necessarily until they responded. I’m not sitting around just writing articles then trying to sell them, trying to place them. I’m just giving the idea for the article and if they say, “Yeah, we’ll be happy to look at it” then, great. I’ll assess how long it will take and write the article. Now if someone says they’d like to take a look at it then I know my chances of getting the OK are really good as long as it’s a valuable article. I don’t create content until I actually get someone to say yes, they’re interested. I really had to break this down. Then I get a response from Ann Handley who was the chief content person at MarketingProfs. Not only that, but now that I’ve been featured in MarketingProfs, I can use the MarektingProfs logo and say I was featured on MarketingProfs. Then I can start reaching out to Huffington Post, or to the Harvard Business Review, or whoever it might be, and I can use the leverage that I have now established or that I’ve created by being published in this first publication. That really is the process. Going back to the template email is just one idea. You can create your own, but the most important elements are to ideally identify the right person, give them something that they can hook into, a reason why they should connect or have someone in common or some place that you’ve written before, or some company that you worked at that’s relevant for them. Tell them you have an idea for an article and that you’d be happy to send it over to them to have a look at, to see what’s it about, why you think it would be an interest to their audience, would they like it, and here’s your authority. Here’s who you are, and here’s where you’ve written for, or here’s an example of some of your writing. This is going to work regardless of whether you’ve written other pieces before or not. You want to use your leverage, your authority. Even if you haven’t written for a lot of publications previously, use your experience of working at a large organization, or of building a business to a $100 million, or whatever it is. That is your unique point; whatever it is that gives you the advantage, bring that up because that will help to further confirm your authority, your expertise, your credibility and will allow you to hook them in. I know it’s not for everyone, as not everyone likes to write, and I get that, but this is one thing I know several of you shared or expressed an interest in. 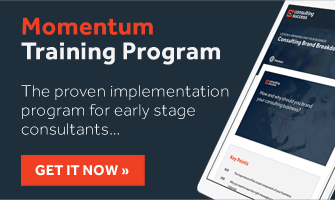 I wanted to really cover it to make sure that you knew what was involved so that you can avoid the trial and error process and use some of the best practices that have been working for me and many others. The above is an excerpt from a presentation Michael gave to his Accelerator Coaching Program clients. 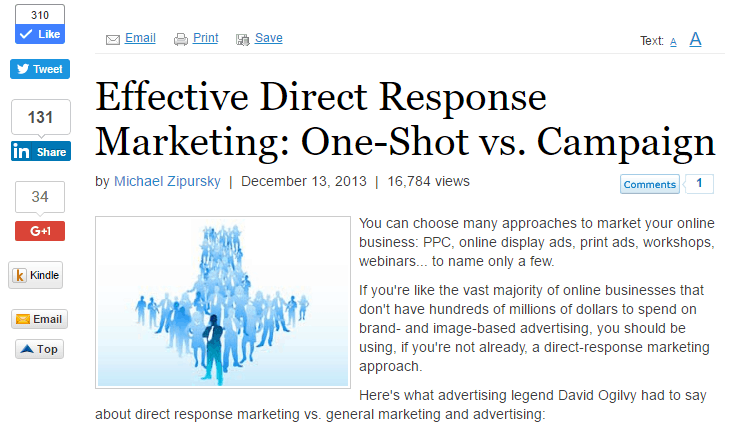 Thanks Michael – an excellent article full of great strategies! Another strategy I have found very useful is that once you’ve identified your target publication, to try and read some back copies so that you can get a real feel for their style of writing and also for the average length of the articles. If you can produce an article for them that’s full of great value, from a trusted authority AND obviously fits their preferred style, you’d be hard to turn down! You’re welcome Simon and great addition!